Grow Wild are collaborating with New X-ING to transform New Cross Road (A2) and other nearby urban areas into an extraordinary bee-friendly environment! British bee numbers have fallen dramatically in recent years, affected by disease, chemicals and habitat loss. Bees are vital; they pollinate our food, keep farmers in business and help our gardens, parks and countryside to thrive. Join in and help feed the bees! Help us reach the target of 1000 sunflowers! Join us at planting workshops at a variety of local schools, community gardens and community centres. 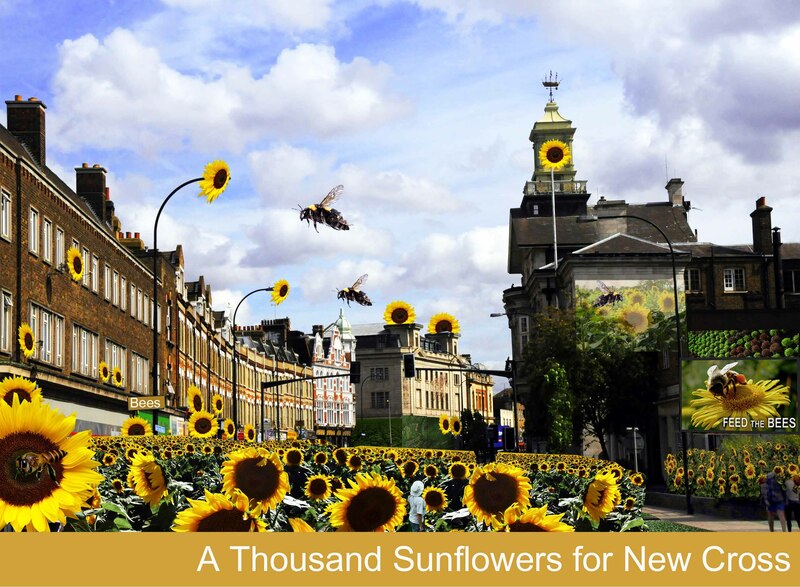 Nurture sunflowers at home, then plant them at Big Sunflower Plant Up events on New Cross Road. Keep an eye on our What’s On page for a variety of fun and inspirational sunflower events coming soon! Key dates to keep in mind are Saturday the 29th of June 1-3pm, Sunday 7th of July 1-3pm and Sunday 14th July 1-2:30pm also. We also need volunteers to help support this exciting new project. The sunflower meadows will need lots of watering and some general maintenance…we’re also looking for volunteers to raise sunflowers at home, or join in at our planting days. If you’d like to help join our Sunflower Volunteer Team please register on our volunteer sign up page here, and mention ‘sunflowers’!